Too much clutter on the screen? Pecha Kucha is a global presentation phenomenon started in 2003 in Tokyo by two expatriates. What is Pecha Kucha? Our friend Daniel Pink sums up the essence of Pecha Kucha in the title of his Wired article on the subject: "Pecha Kucha: Get to the PowerPoint in 20 Slides Then Sit the Hell Down." The Pecha Kucha method of presentation design and delivery is very simple. You must use 20 slides, each shown for 20 seconds, as you tell your story. That's 6 minutes and 40 seconds. Slides advance automatically and when you're done you're done. That's it. Sit down. The objective of these simple but tight restraints is to keep the presentations brief and focused and to give more people a chance to present in a single night. 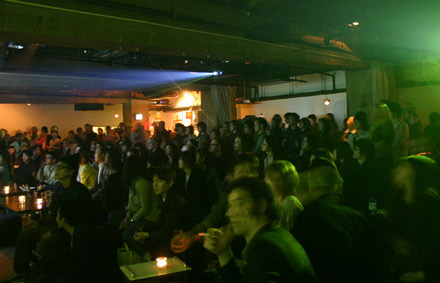 I attended my first Pecha Kucha Night in Tokyo last May and the place was packed so tight with such a buzz in the crowd that it was difficult to hear some of the presenters. Pecha Kucha Nights are held in cities from Amsterdam and Auckland to Venice and Vienna. Checkout the main Pecha Kucha Web site to find info on the Pecha Kucha night near you. If you search on YouTube you can find some example presentations, but none that I can find really do the method justice (if you know of a good quality video please let me know). This clip from Tokyo below pretty much shows how it went on the night I attended as well (in Japanese with some English on the slides). If nothing else, I think Pecha Kucha is good training and good practice. Everyone should try Pecha Kucha; it's a good exercise for getting your story down even if you do not use the method exactly for your live talk in your work. It does not matter whether or not you can implement the Pecha Kucha "20x20 6:40" method exactly in your own company or school, but the spirit behind it and the concept of "restrictions as liberators" can be applied to most any presentation situation. The method makes going deep difficult. But if there is a good discussion after a Pecha Kucha type of presentation then it may work well even inside an organization. I can imagine having college students give this kind of presentation about their research followed by deeper questioning and probing by the instructor and class. Which would be more difficult for a student and a better indication of their knowledge: a 45 minute recycled and typical PowerPoint presentation, or a tight 6:40 presentation followed by 30 minutes of probing questions and discussion? If you want to see a good example of the Pecha Kucha method (sans speaker, just slides and narration) watch this nice piece below put together by Dan Pink on signs. Dan's topic is very interesting to me as I too am a big fan of signs and notice them all the time. I snapped this pic below in Manzanita on the Oregon Coast this summer. Another great example of "emotional intelligence" that produces "a smile in the mind" for all those who pass by (and it may lead to greater compliance as well). Your practical application bears similarities with my experiences. Last year I presented my research work and some of my newer thoughts on Tools For Inspiraito at a rotterdam Pecha Kucha. The constraints were really liberating and the crowd and atmosphere was good (failing is no problem), but I felt that the drinks, music and DJ's during the breaks made it somewhat shallow in its follow-up. No discussion, no feedback apart from the "good work" or "nice". And a Christmas-tree-shaped egg-timer, set to 5 minutes. As a corporate filmmaker, I was quite taken by this approach but wasn't sure why. Then I realized it is the same structure I often employ when producing corporate films; every 20-30 seconds I change the music, the interviews, the graphics, etc. It makes a seven minute film feel like half that. What an interesting presentation format. And I like the idea of 'liberating constraints,' it's a catchy counter-intuitive. I wouldn't mind seeing a little more wiggle room, however. For instance, as a guideline there is a new slide at every twenty second interval. Except that each individual slide can still be a + or - 3 second derivation from that. Which I say only because there's something graceful about the images lining up with the storyline seamlessly. In the signage example you provided it was close, but there were a few instances where I felt the visual flow would have been dramatically improved with the slides taking a slight change of pace. Please post any fresh/provocative examples of Pecha Kucha you might find. I'm considering exploring this medium with my students (9th humanities) and would love to have some more models for them to see. I just participated in my first Pecha Kucha event last week and it was quite liberating. Amazing how much information you can convey in 6:40 when you've got it concise and well-planned. I took video of the presentation. I'd love to share it and get people's thoughts. While this is where I first learned of pecha-kucha some time ago, the other part I really remembered from this blog was the stuff about signs in Dan Pink's presentation. I just looked it up while recommending this entry to a friend who's developing some signage at a university to encourage people to use the stairs instead of elevators, to save energy and encourage healthier lifestyles. I remembered there being more content on this topic than is here, but maybe it's just because it really resonated with me at the time. 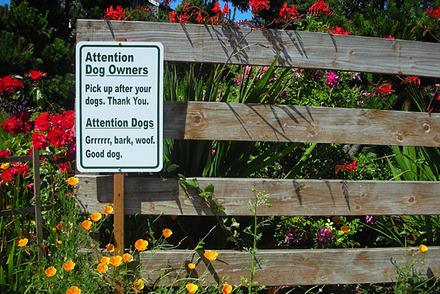 It also reminded me of my favorite example of emotionally intelligent signage. I-94, which runs through Michigan to Chicago and beyond is notorious for always having construction at some point or another in Michigan. For some years in the early to mid-90s, the construction crews started using a modified version of their "Road Construction Next 20 Miles" signs. They still posted these every 5 miles or so to let you know how much construction was left, but they added an important touch. The first one had a standard style yellow smiley face, but frowning instead of smiling, under the message, so it read like this: "Road Construction Next 20 Miles. :-(" The next one had a similar message, but the mouth was only slightly downturned. The sign after that read: "Road Construction Next 10 Miles. :-|", followed by another one with a slightly upturned smile and finally ending with "Road Construction Completed :-)". It was pure genius. I loved it and it made me feel far more tolerant of the construction hassle. It was so affective (in both senses of the word) that I'm still talking about it 15 years later, even though they :-( don't use them anymore.